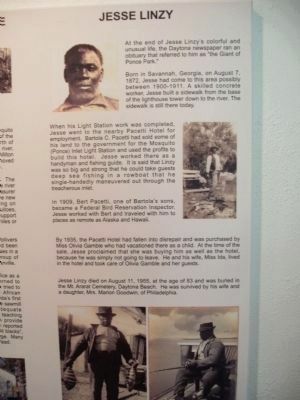 Born in Savannah on August 7, 1872, Jesse Linzy came to Mosquito (now Ponce) Inlet possibly in the late 1890s. A skilled concrete worker, he built the sidewalk from the tower down to the river, replacing an old wooden boardwalk. The sidewalk still exists today. When his Light Station work was completed, Jesse Linzy went to the nearby Pacetti Hotel where he worked as a handyman and fishing guide. In 1909, Jesse became the assistant to a Federal Bird Reservation Inspector and traveled with him to places as remote as Alaska and Hawaii. Jesse Linzy died on August 11, 1955, at the age of 83. He was buried in Daytona Beach's Mt. Ararat Cemetery. 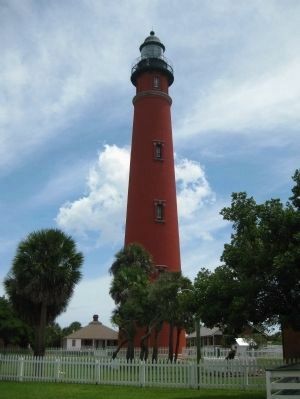 Erected by Ponce de Leon Inlet Lighthouse Museum. this postal address: 4931 South Peninsula Drive, Port Orange FL 32127, United States of America. Touch for directions. Other nearby markers. At least 8 other markers are within walking distance of this marker. Bronze Bell (a few steps from this marker); 16th Century Anchor (within shouting distance of this marker); Oil Storage House (within shouting distance of this marker); Kedge Anchor (within shouting distance of this marker); Ponce Inlet Veterans Memorial (within shouting distance of this marker); Gladys Meyer Davis Home (within shouting distance of this marker); Principal Keeper's Dwelling (within shouting distance of this marker); Second Assistant Keeper's Dwelling (within shouting distance of this marker). Touch for a list and map of all markers in Ponce Inlet. More about this marker. 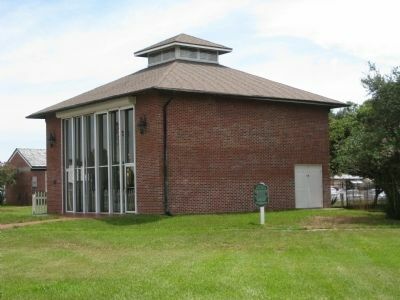 The marker is within the museum compound, next to the Ayres Davies Lens Exhibit Building (which houses one of the finest collections of restored Fresnel lenses in the world). The marker may be seen at a distance from outside the museum complex. Born in Savannah, Georgia, on August 7, 1872. Jesse had come to this area possibly between 1900-1911. A skilled concrete worker, Jesse built a sidewalk from the base of the lighthouse tower down to the river. The sidewalk is still there today. When his Light Station work was completed, Jesse went to the nearby Pacetti Hotel for employment. This is a local story about Jesse and how he would row guests of the hotel out into the fishing grounds as a guide. He would row by himself, out and back. He was a strong man who worked very hard. Bartola C. Pacetti had sold some of his land to the government for the Mosquito (Ponce) Inlet Light Station and used the profits to build this hotel. Jesse worked there as a handyman and fishing guide. It is said that Linzy was so big and strong that he could take guests deep sea fishing in a rowboat that he single-handedly maneuvered out through the treacherous inlet. In 1909. Bert Pacetti, one of sons, became a Federal Bird Reservation Inspector. Jesse worked with Bert and traveled with him to places as remote as Alaska and Hawaii. By 1935, the Pacetti Hotel had fallen into disrepair and was purchased by Miss Olivia Gamble who had vacationed there as a child. At the time of the sale, Jesse proclaimed that she was buying him as well as the hotel, because he was simply not going to leave. He and his wife, Miss Ida, lived in the hotel and took care of Olivia Gamble and her guests. 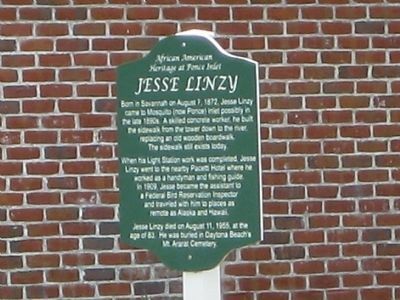 Jesse Linzy died on August 11, 1955, at the age of 83 and was buried in the Mt Ararat Cemetery, Daytona Beach. He was survived by his wife and a daughter, Mrs. Marion Goodwin, of Philadelphia. — Submitted December 1, 2010. More. Search the internet for Jesse Linzy. Credits. This page was last revised on July 22, 2018. This page originally submitted on August 28, 2010, by Glenn Sheffield of Tampa, Florida. This page has been viewed 1,117 times since then and 14 times this year. Photos: 1. submitted on August 28, 2010, by Glenn Sheffield of Tampa, Florida. 2. submitted on August 29, 2010, by Glenn Sheffield of Tampa, Florida. 3. submitted on November 2, 2010, by Rick Shell of Noblesville, Indiana. 4. submitted on August 29, 2010, by Glenn Sheffield of Tampa, Florida. • Bill Pfingsten was the editor who published this page.